The Seattle Center's new KeyArena was officially completed in late October, and already has hosted a world-class concert and several Thunderbirds and Sonics games. The new facility, which was built on the foundations of the former Coliseum, boasts approximately 3,000 additional seats, three new seating levels, improved sight lines, and expanded concessions. The $73 million project created a beautiful new facility that would have cost $135 million or more to build from scratch. Re-using the massive steel roof trusses and concrete frame saved more than $15 million. The Seattle Center location saved $15 to $20 million in property and landscaping costs, compared to similar projects in other cities. In addition, the Sonics invested $15 million in kitchen, concession, commissary and team areas. Best of all, the $73 million project will not cost Seattle taxpayers a dime: revenue from the new building will pay the entire renovation cost, and provide increased revenue to support other Seattle Center programs. 58 wheelchair locations are provided in the suites. Three elevators are available for getting to the various levels. A significant effort was made to recycle, re-use and reduce during the construction of KeyArena. The original building was recycled instead of torn down and rebuilt. Its shell was kept, while the interior of the building was completely renovated. Pieces of the former building's acoustical ceiling were cleaned and re-used for sound buffers. The cobblestones inside the building and outside the building were recycled from the plaza of the former International Fountain. These cobblestones originally were recycled in 1962 from the old streets in the city. The demolition and scrap materials were recycled throughout the project. These items include plastic, steel, copper, wood, gypsum board and cardboard. Precast concrete wall panels and steel joints removed from the NASA Building (which was used for storage) were re-used to build the new commissary. Other re-used items include the cooling chillers, major landscape materials, and use of existing West Court Building for the Sonics retail store. The landscaping around the KeyArena involves 9,000 plants in a total area of 32,000 square feet. Last winter, Seattle Center gardeners created a contemporary design with a Northwest flair that would look as good from the inside of the building as it did from the outside. The landscaping focuses on a diversity of plants with a mix of evergreen, deciduous, and flowering plants, including a variety of grasses and conifers. The Sonics Team Shop is one of the largest team-owned and -operated retail stores in the NBA, and is open year-round. The new store features unique, quality Sonics memorabilia from the NBA's top licensees. A 50-foot jetway connecting the KeyArena concourse and the Sonics Team Shop will set the atmosphere for an exciting shopping experience. Action-oriented, life-sized photographs; pulsing audio; and neon streaks will help build the excitement as fans approach the shop thorough the jetway. The store's interior integrates multimedia technologies with gigantic basketball displays that will keep fans in tune with the excitement of the NBA. The center speaker system at KeyArena is a sophisticated exploded center cluster design, with four sets of speakers hung above the goal lines for basketball in north, south, east and west clusters. The clusters are time-delayed for proper arrival times of sound to the clusters. The south cluster can be rotated to supports south-end stage productions. The KeyArena is located on the grounds of the Seattle Center (formerly the site of the 1962 World's Fair) in the lower Queen Anne area of Seattle. (From Interstate 5) Take the Mercer Street exit from I-5 and follow the brown-and-white visitor's signs to the Seattle Center. The KeyArena is located on the northwest corner of the grounds with street access along First Avenue North and cross streets Thomas and Republican. Public parking is available along First Avenue and Fifth Avenue North, Mercer Street, and throughout lower Queen Anne. If you are staying downtown you can catch the Seattle Center Monorail that leaves Westlake Center (Pine Street between 4th and 5th) every 15 minutes on the hour. An arbitrator has ruled in favor of the Seattle Supersonics in a dispute with KeyArena over whether the team owed rent during the NBA player lockout. The lease says the team does not have to pay for games missed because of a labor dispute, but the city said the clause did not apply if the owners locked the players out. The arbitrator did not explain the ruling, but said the team got to keep most of the $341,144 in rent it withheld. The decision meant a loss to the city which had already decided to refund more than $1 million in lease payments from luxury suite holders. Developers of a proposed WNBA franchise for Seattle grudgingly accepted new lease terms outlined by the Seattle City Council that sets the team's rent at $20,000 a season, but requires it to pay $100,000 in advance and recoup the balance from earnings. Team officials called the amended provision of the three year lease "unethical and unfair," but said they would submit it to the league in hopes of being part of the 2000 expansion program. The unnamed team has already sold 5,500 season ticket pledges. The team had negotiated with the city and believed it had a deal to cover expenses. Council officials said the extra money was for rent. The higher rent will hurt the team because its ticket prices were based on earlier negotiations. The city is still smarting from money it lost during the NBA lockout. 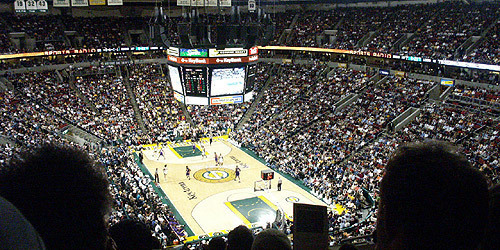 An arbitrator ruled in favor of the Seattle Supersonics in a dispute over whether the team owed rent during the lockout. The lease says the team does not have to pay for games missed because of a labor dispute, but the city said the clause did not apply if the owners locked the players out. The arbitrator did not explain the ruling, but said the team got to keep most of the $341,144 in rent it withheld. The decision meant a loss to the city which had already decided to refund more than $1 million in lease payments from luxury suite holders. The new WNBA team would be owned by the Ackerly Group, which also owns the SuperSonics. The SuperSonics pay $874,000 a year in rent. March 30, 2001 - The structure that houses KeyArena opened in 1962 as the Seattle Center Coliseum. It is part of a larger exhibition complex known as the Seattle Center that was built to host the 1962 World's Fair. In 1967 the NBA awarded an expansion franchise to Seattle and the team known as the SuperSonics settled into the Coliseum as their new home. As the years went by the building began to show its age and by the early 90's it became apparent that the Sonics would need a new home with all of the amenities of a more modern arena. In an unusual move it was decided that the Coliseum would be closed for a year and it would be remade into a state of the art venue. In the meantime the Sonics would use the Tacoma Dome as a home base and in the fall of 1995 the Coliseum reopened its doors as KeyArena. Included in the Seattle Center complex are many unique exhibition halls as well as Seattle's signature landmark, the Space Needle, just a short walk away. The architecture of this building is certainly unique, with a pyramid shaped roof and plenty of glass, spectacular landscaping and colored pavement. The main plaza is on the west side of the arena where there is a small marquee displaying ads for the current and future events. In another unique move, the Sonics have their team store on 1st St. in a building separate from the arena...or so it seems. After one is finished checking out the shop there is an underground passageway that takes you right into the arena concourse. "The Key" is a four sided building in the shape of a pyramid, though the incline of the slope is not as sharp as most buildings of that shape and one can enter the building through any of the four sides. In at least one of the entrances there was a mural with several monitors showing the fans entering the venue from outside. This is a two concourse building with stairs to take one up to the upper level. At many points in the upper level one can get a good view of the action in the lower concourses. From the lower concourses one can look outside the building as well, which is attractively landscaped and bears a sloped limestone and fieldstone veneer and lots of glass. For the most part the concourses are wide and bright and filled with plenty of souvenir and concession stands. At the main entrance is a large sculpture taking up the entire wall, which is some sort of huge musical string instrument. Strum your fingers along the strings and an array of light and shooting water will entertain you. Of course being Seattle there was no shortage of espresso stands here and with Starbucks now being the majority owner of the Sonics . "The Key" is already being nicknamed "The Coffee Pot" by the locals. Two main seating levels with a level of suites separating the two. There are club seats at the top of the lower sideline with its own exclusive concourse which we found nothing to write home about. The eight sided scoreboard sits above center court and simultaneous scrolling ad panels ring the arena above the suites interspersed with dot matrix boards showing game stats and out of town scores and other miscellaneous ads. Interesting to note that the setup for hockey is much different from what we normally see in most arenas. Here they simply roll back the seats at one baseline and leave the other intact for either sport. This creates a look similar to what we see at Rochester's Blue Cross Arena where the center scoreboard bcomes somewhat off-center. Above the arena bowl are the banners. On one sideline there is a huge "GO SONICS" banner centered amidst a pair of Seattle Thunderbird (WHL) championship banners. What? No 1916 Metropolitans' Stanley Cup banner? We were hoping that there would be something in the building to honor the first US based team to win the Cup but none to be found. At the other sideline is where jerseys honoring Lenny Wilkens, Jack Sikma, Freddy Brown, and current head coach Nate McMillan hang alongside the Sonics' division, Conference and '79 NBA title banners. Also interesting to note that Wilkens' banner is for his time as a player and as a coach and at times in Seattle did both at once. During the first half we sat behind a pair a college age kids one of which had a funky 70's haircut. We didn't think much of it of course until a bunch of grammar school children converged on him looking for his autograph. It was then we realized that the funky haired college kid was none other than Gonzaga's sharpshooting star guard Dan Dickau. We exchanged pleasantries and went about our ways as he disappeared to somewhere else for the second half. Overall, a great place for a game and very nice arena. Not an overwhelming venue but one we'd have no problems checking out again. We came away much more impressed with the renovation of the arena in Seattle than with the similar job done in Oakland at the New Arena. Washington State Gov. Christine Gregoire has called on Seattle city officials to strike a deal with the SuperSonics to remodel KeyArena or acknowledge that they aren't interested so the team can make other plans. In a letter to Mayor Greg Nickels, Gregoire said: "The Sonics and Storm deserve to know their status with the city so the team can decide whether or not to pursue other options. If the city intends to pursue a future for the area that does not include Sonics and Storm, it is time to communicate that to them so they may consider alternatives within Washington before contemplating a long-distance move." Gregoire says she wants the teams to stay, but fears the longer the situation remains unresolved, the greater the likelihood that the team will move out of state. Nickels offered no reaction to the letter. The state legislature was prepared to offer a financing plan this year, but adjourned without acting because the city did not get involved in the process. The team has said a deal must be made this year or it could begin looking for a new home. The Sonics proposed taking over management of KeyArena if the state approved a $220 million remodeling program. The team said it would pay for all construction cost overruns if it gets all building revenue. The Sonics would also pay rent which would help the city deal with its debt payments. The arena is owned by the city, which recently received a report saying the building could survive without the team, but only if it left the area and did not build a competing venue. Even then, the city should be prepared to invest in building improvements so it can attract events that keep the building busy. Since 2001, KeyArena has not made enough money to cover its debts. Over the same time, the Sonics say they've lost $58 million. The team's lease expires in 2010 and the Sonics say they intend to honor the agreement. The Seattle SuperSonics have offered Seattle another deal for upgrades to KeyArena and have set a deadline of one month for an agreement to be reached. The deal calls for $18.3 million of team money toward a $220 million renovation plan. The team would pay for all cost overruns and pay $1 million a year in rent for 20 years. The team also wants full control of arena management and improved lease terms. City officials said it was a great starting point, but the team said there wasn't much room for negotiation in the terms. Some city leaders reacted to the proposal saying it involved too little money for the team and too much from the city. City Council President Nick Licata is working on his own proposal to sweeten the terms of the lease for the owners of the Sonics and WNBA Storm. With the state's help, he said, the city could wipe out the teams' $50 million remaining debt for 1995 renovations. Licata's package also would do a "very modest remodel" of KeyArena, fund a new arts center and renovate the Seattle Center overall. "But that will go forward whether the Sonics are willing to stay or not," he said. Some City Council members complained that the options offered to them gave too much to the Sonics and did not improve the building sufficiently for other users such as concert promoters. Solving that problem could be difficult because the 368,000-square-foot building is said to be too small for some events or for needed amenities. The city has also been critical of the Supersonics and believe the team has not worked hard enough to sell luxury suites at KeyArena. Only about 45% of the suites at KeyArena are leased compared with more than 90% in other venues surveyed by the city. Teams in the other buildings get all luxury suite revenue while the Sonics only keep 40% of suite revenues. Last week, NBA Commissioner David Stern said Seattle is not interested in hosting an NBA franchise, so it's time for the league to leave the city. Stern also says the team's current owners don't want to own a team that's not based in Seattle and suggested that a sale may be in the works. The Sonics' lease runs through 2010 and the team's current owners say they intend to honor the lease. If the team is sold, there are venues that would like an NBA franchise. The Anschutz Entertainment Group, which is investing in a new arena in Kansas City that it will also manage, has said it would like to bring an NBA or NHL team to the venue. Arrowhead Pond in Anaheim, Calif., has also been long-rumored to be a potential NBA homeland. A new arena proposed for Louisville is also being built to NBA standards. Seattle, Wash. - The city of Seattle has regained $615,000 of $2.3 million lost in naming-rights revenue when KeyCorp agreed to renegotiate its deal and continue as the title sponsor of KeyArena. "We have found Key to be an outstanding corporate citizen and we're delighted to continue our partnership," Seattle Center Director Robert Nellams said in a statement. When the city accepted a $45 million buyout that allowed the Sonics to move to Oklahoma City, it terminated a 15-year deal signed in 1995 with KeyCorp that generated $1.1 million in revenue in 2007. City officials approached the Cleveland-based bank in September and the two sides settled on a two-year deal in which KeyCorp pays the city $300,000 next year and $315,000 in 2010. The agreement is subject to approval by the City Council, which will vote in December. Seattle, Wash. - Seattle Mayor Greg Nickels said he hasn't spoken to anyone with the NBA since the Sonics left town in the summer, but he feels "the door is open there" to the league returning to what would be a remodeled KeyArena. Nickels said Seattle has already presented the outline of a new plan to state lawmakers, seeking to authorize the use of local tax revenues currently going to the Washington state convention center. The city wants that money to be used to remodel the building the Sonics said was obsolete before they deserted it. "We'll be going to the Legislature in their next session" beginning in January, Nickels said at a ceremony inside KeyArena to announce Seattle University will be using it when the school returns to Division I basketball this season. Nickels said Seattle will ask for authorization to divert 1 percent of the existing hotels tax in Seattle from the convention and visitors bureau to the city. He said the convention center no longer needs those revenues and the city should get them "just like every other city does." "Those funds (would be) available for an NBA franchise," he said. They could generate enough money to back $75 million in bonds - the missing piece in a $300 million arena renovation plan proposed by Microsoft Chief Executive Steve Ballmer. Ballmer's group would contribute $150 million. Another $75 million would be culled in city dollars from other sources. In a statement after the Sonics and Seattle settled their lease dispute in July, NBA commissioner David Stern said the league would help Seattle acquire a new team if state lawmakers approve a KeyArena remodel before the end of 2009. Seattle, Wash. - A new plan to divert a portion of hotel-tax money from the state convention center to a remodel of KeyArena could help Seattle begin pursuing a replacement NBA team as soon as 2010. NBA Commissioner David Stern said "positive" talks have gone on between the league and a potential ownership group headed by Microsoft Chief Executive Steve Ballmer, who led an ill-fated plan to save the Sonics earlier this year. Deputy Mayor Tim Ceis confirmed the talks, and said he was optimistic that this time around the city's request for state authorization will meet little resistance when the Legislature convenes in January. "It should be noncontroversial, because it's a city-only tax that already exists and will not be an increase," Ceis said of the latest attempt to find a long-sought public portion of a proposed $300 million renovation for a building currently deemed financially obsolete by the National Basketball Association. "If we can get our funding package together this session, we can start to work with the Ballmer group on identifying a team for Seattle, but probably not until 2010." Stern, speaking to reporters on his annual season-tipoff conference call, made his first public comments on Seattle since the Sonics left. "I don't want to mislead, so I will say that we have had some contact and we're aware of what's going on," he said. "I'd rather not deal with the specifics of it at this time, but we have had some positive contact." While no city official has talked to Stern, Ceis said standard procedure always has been for Stern to go through the owner, or potential owner. He confirmed that Stern and Ballmer have talked, and Ballmer conveyed the new funding plan for the public portion of the remodel. The tax under consideration is different from the so-called stadium taxes from King County that the Sonics, as well as the University of Washington, pursued in recent sessions to fund their sports building projects. A 7 percent tax on all hotel bills within the city long has been dedicated to convention center operations. The city, which is still negotiating with the hotel industry and center officials on the proposal, seeks to divert one-tenth of the revenue to Seattle Center and the KeyArena project. Ceis said that growth in hotel-room rentals over the past 10 years is generating enough revenue for the diversion to produce over a 15-year period the $75 million necessary to finance construction debt without compromising convention center operations. Last year the Ballmer group, which included a former part-owner of the Sonics, telecommunications mogul John Stanton, committed $150 million in private money to the remodel. The city dedicated another $75 million in future admission taxes. But when the Legislature did not take up the city's request for the balance through diversion of stadium taxes, Seattle had no arena plan that might have helped forestall the NBA's decision to grant owner Clay Bennett's request to move the Sonics to his hometown of Oklahoma City. The settlement, which paid off the $34 million in construction bond debt remaining from a remodel completed in 1995, included a provision for another $30 million to the city by 2013 if an NBA team had not moved to Seattle. But the city had to have an NBA-ready arena, or the funding committed for one, by Dec. 31, 2009. For practical purposes, that means the pending session in Olympia will be last chance for any funding requiring state authorization. Since the NBA has no current plans to expand domestically, the only option would be to relocate a team from another city. As many as half the teams in the NBA may have had operating losses last season, and some of the smaller-market teams have been in financial trouble for a while, including Memphis, New Orleans and Milwaukee. The Sacramento Kings also have been stymied in securing public funding for a replacement building for Arco Arena. Unless a team is at the end of its lease, the Ballmer group would be in the same position Bennett was in Seattle - an out-of-town owner attempting to pull away a team under contract with its city. Seattle, Wash. - Seattle city leaders are now saying that tax money for a remodeled KeyArena could be used for something else if the NBA doesn't return. Seattle Deputy Mayor Tim Ceis told top civic and tourism leaders that he wants the $75 million to be used on the entire Seattle Center. The city has been focused for months on asking the legislature for one percent of the local hotel-motel tax that was used to pay off the convention center to instead pay for a KeyArena makeover. But now, Ceis believes lawmakers may be more likely to approve the proposal under different conditions. "We think it's better to allow the authority to be allowed for the entire Seattle Center grounds and, if we do get an NBA team, we do have a revenue stream for it," said Ceis. The Seattle Center just finalized a comprehensive 20 year master plan which calls for a renovated Seattle Center House and Memorial Stadium at a cost of more than $500 million, but with no real way to pay for it. Seattle, Wash. - The Storm has agreed with the city of Seattle on a 10-year lease to keep the WNBA team at KeyArena. The city began working with the Storm's owners last February to negotiate a long term lease. In the new lease, the Storm will be charged a lower rental fee and will share in some of the revenues, as a long-term tenant. "KeyArena is a terrific home court for all the fans who have been so loyal to the Storm over the years," said Anne Levinson, chair of Force 10 Hoops, who negotiated the lease on behalf of the team. "We appreciate the city partnering with us so that we can keep ticket prices affordable for a diversity of fans and families throughout the region." Levinson is one of four local businesswomen who purchased the team from Clay Bennett last year. 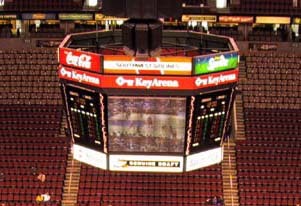 KeyArena has been the home court of the Storm since its first season in 2000. The lease agreement is subject to City Council approval. The Storm still needs renovations to KeyArena. When Bennett moved the Sonics to his native Oklahoma, he also stripped the facility of its plush courtside seats, high-tech televisions and other equipment. Seattle, Wash. - State Rep. Ross Hunter says he has a plan to help pay for a Key Arena remodel, but the city of Seattle may not be happy about it. Hunter, the House Finance Committee Chair, says he's drafted a proposal which would send this issue back to the voters of Seattle. Hunter says the bill's language could call for a public vote on a property or business tax increase in order to pay $75 million of the Key renovation. Seattle's Mayor Greg Nickels had been backing an idea to shave 1 percent of the hotel/motel tax currently designated to pay off the state convention center, and direct it toward the Key. But Hunter says the math doesn't add up and the state's general fund would actually take a hit based on current projections. Seattle city leaders publicly maintain they're still working on a proposal to get through the legislature during this session. Seattle, Wash. - Hope appears to be fading that Seattle will collect a $30 million bonus from the Oklahoma group that bought the Sonics. Seattle officials have rejected a proposal for meeting the terms of a lease-breaking deal between the city and Clay Bennett's firm, said Rep. Ross Hunter, chairman of the House Finance Committee. "I was willing to offer the bill as a courtesy to the city," Hunter said. "They don't want me to introduce the bill." Deputy Mayor Tim Ceis countered that Hunter's bill would not meet the terms of Seattle's deal with the business that bought the Sonics. But he has not yet written off the $30 million. When Seattle let the Sonics out of their KeyArena lease early for $45 million, Bennett's group promised to pay an additional $30 million if the city renovated KeyArena yet failed to attract a new NBA basketball team. That deal specifically required that the Legislature buy into a renovation financing plan before adjourning its 2009 session this spring. Hunter said his plan meets that criterion - by simply providing the city taxing authority it already has. He is prepared to propose a bill that would allow the city to increase Seattle's property or business taxes, with voter approval. "It seems very straightforward. It's their tax stream; it's their decision," Hunter said. "The bill is sitting on my desk. They asked me not to introduce it." Ceis said Hunter's proposal doesn't cut it. "It's got to be something that works to meet the terms of the (lease) settlement agreement," Ceis said. "I'm not certain that the piece of legislation he showed us accomplishes that. In fact, I know it doesn't," Ceis said. The city already has authority to ask voters to increase property taxes through levies and to ask for business tax increases, too. Still, Hunter said, his bill technically meets the terms of the lease-breaking deal. "The agreement we have with the Oklahoma boys says that we have to give (the city) authority to do that. The deal depends on me giving them something," Hunter said. "That would enable them to get their $30 million." Hunter says the city is pushing another tax idea, but neither side will discuss it. "They're working hard at figuring out the details and making sure it's viable," Hunter said. Seattle, Wash. - Eight months after a settlement allowed the Sonics to leave town, the City Council is set to endorse a new agreement with KeyCorp for naming rights to KeyArena at a discount price of $600,000. The contract, renegotiated in the summer of 2008, would keep KeyArena's logo above Seattle Center for another two years at $300,000 a year. Under the former contract, which was contingent on having an NBA tenant in the building, KeyCorp was due to pay $1.3 million in 2010. The Ohio-based bank signed a 15-year contract for sponsorship rights in 1995 after the arena was remodeled. The Sonics were sold to new owners in Oklahoma City, led by Clay Bennett, who paid $45 million last year to settle a lawsuit filed by the city to keep the team in Seattle. The agreement also saves the city from having to remove the KeyArena signs, including the big neon letters above the building, and other promotional materials, which would have cost about $250,000, Daoust said. In addition to the Sonics, KeyArena lost the Seattle Thunderbirds, who moved their junior league hockey team to Kent's new events center. KeyArena has since signed the Seattle Storm to a new 10-year contract and brought in the Rat City Rollergirls for five bouts this year, which have been immensely popular, Daoust said. Also expected to play home games at KeyArena is Seattle University's men's basketball team, the Redhawks, who are returning this year to NCAA Division I competition, she said. Olympia, Wash. - The Washington legislature is considering a bill that could fund improvements to KeyArena and put the Oklahoma City Thunder in the position to pay $30 million to Seattle, but observers say the bill is all but dead. The legislature adjourns Sunday. Senate Bill 6116 would allocate a portion of existing restaurant and car rental taxes to pay for the arts and housing for poor people as well as for improvements to KeyArena. Specifically, the measure says: "If by 2013 the city of Seattle has a lease with an NBA team the 2 percent car rental tax and the King County food and beverage tax raised within Seattle must go to pay for bonds for necessary improvements to Key Arena." To break his lease at KeyArena and move the team, Bennett agreed to pay $45 million. He also agreed to pay the city another $30 million if the NBA doesn't send a new team to a revamped KeyArena by 2013. However as part of that deal the Legislature has to approve a revenue stream for a facility by the end of this year - or Bennett gets to keep his money. Olympia, Wash. - Legislation that could allow the City of Seattle to fund upgrades to KeyArena and collect $30 million from the new owners of the SuperSonics could be revived in a possible special legislative session of the Washington legislature. The legislature adjourned without taking action on the bill. The bill would extend an existing hotel and restaurant tax. Doing so could allow King County to fund the improvements. When the SuperSonics left town, to be reborn as the Thunder in Oklahoma City, the new owners promised $30 million to the city if funding for upgrades or a new building was in place this year. It's not known yet whether a special session will be called or when it might take place. The city has said the $300 million KeyArena upgrade could be paid for with $150 million from a potential ownership group headed by Microsoft's Steve Ballmer, $75 million from the city and $75 million raised by new tax sources or an extension of the current taxes. Seattle, Wash. - The Seattle Times says Seattle Center officials are shopping the naming rights to KeyArena after KeyBank let its contract expire Dec. 31. Bill Boucher, KeyBank's regional marketing director, told the newspaper the bank valued the presence it got from the sponsorship but decided not to renew the contract. "Like every company, we continuously review our portfolio of sponsorships and strive to improve their impact and return on investment," Boucher said in a statement. Cleveland-based KeyCorp, the bank's parent company, paid the city $300,000 annually for the past three years even though it could have walked away after the Sonics left for Oklahoma City in 2008. Before the team's departure, KeyCorp had paid the city $1.3 million a year since 1995. In a statement, Seattle Center Director Robert Nellams told the Times he was confident the city would find a new partner. "There's very strong interest by local and national companies that recognize this kind of title sponsorship opportunity doesn't come around often," Nellams said. The arena's 2011 event lineup, recent renovations and the upcoming 50th anniversary of the 1962 Seattle World's Fair, The Next Fifty, make the opportunity "very appealing," he said. State representatives Mike Hope and David Frockt led a taskforce meeting, presiding over a brainstorming session with the goal of finding ways to fund a new arena in or around Seattle, the website SBNation.com reported. The goal, they say, is to bring the NBA/NHL to Seattle with a plan that involves no additional tax-payer money. 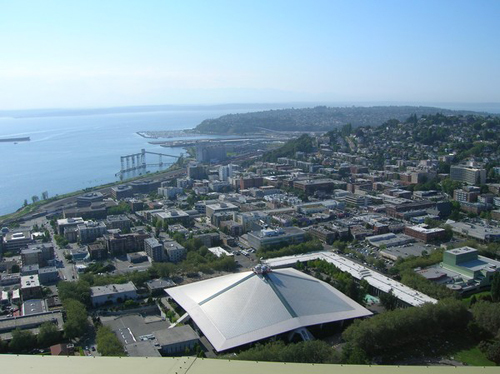 Seattle, Wash. - Representative Mike Hope has drafted legislation that will fund a new arena, KING reported. He believes it will not only bring an NBA team to Seattle, but a professional hockey team as well. The proposed legislation would require local and visiting professional athletes in the NBA, NFL and MLB to pay a fee for every game they play in Seattle. He says a lot of other cities already have similar laws built into their tax revenue. Hope says it would levy $140 million towards a new sports arena. He's also proposing specialty license plates for Sonics fans, generating another $10 million for bonds. According to Hope, now is the time for the arena because construction costs are lower than they were in 2006, the last time the idea of building a new arena was floated. Hope is optimistic the bill will pass because he believes it will gain bi-partisan support. He will be begin lobbying fellow lawmakers soon and officially introduce the bill in January during the regular session. Brian Robinson, co-founder of the organization Save our Sonics, is on a task force with Hope aiming to bring the NBA back to Seattle, but in a new venue. "It's affected a lot of people who used to watch these games with their kids," said Robinson. "The fact that we could see politicians actually get something done would bring a lot of excitement to a lot of people." Seattle, Wash. - Seattle city officials have been approached by a private group looking to build a basketball arena in the Sodo District near Safeco Field in the hopes of attracting an NBA franchise, according to two sources briefed on the talks and who spoke with the Seattle Times. The proposal involves an investor who has acquired property, apparently south of Safeco Field, although at least one business owner has declined to sell, according to the sources. Mayor Mike McGinn has been working with the group for several months to explore how the city can aid the effort, including help with financing, the sources said. McGinn's office confirmed to the Times that it is examining an "opportunity," but declined to provide specific information. "Our office has had many enthusiastic overtures concerning the return of an NBA franchise to Seattle," the statement said. "Some of these offers have been serious. Some have not been serious. And the current speculation is over one of these proposals. We are looking at this opportunity, examining its specifics and how it fits our city. At this point, we have not received a concrete offer." The statement added: "When we do reach that point, the City Council will be our first step in moving forward and then there will be an open process to evaluate that offer before we move forward. We would welcome a serious commitment from the NBA to re-establish a franchise with responsible ownership, to our community." McGinn has expressed an interest in the city playing a role in the financing, one of the sources said, noting the controversy that would generate. In 2006, Seattle voters overwhelmingly approved an initiative that says the city must make a profit on any investment it makes in a sports arena. A new arena has been considered essential to acquiring an NBA team. If an arena site were found and financing for the project obtained, investors would have to work with the NBA to attract a new franchise or buy an existing team, such as financially struggling teams in Sacramento and New Orleans. The group behind the Sodo effort is separate from a recently publicized campaign being led by longtime Sonics fan Brian Robinson and his organization, Arena Solution, to secure a new arena and an NBA team. Among those involved in the Sodo plan is Wally Walker, the former Seattle Sonics player and team executive, the sources said. Walker was a minority owner of the Sonics, serving as the team's president and general manager from 1994 until the team was sold to Clay Bennett in 2006. If built, the arena would add a third professional sports facility in the Sodo District, joining Safeco, home of the Seattle Mariners, and CenturyLink Field, home of the Seattle Seahawks. Microsoft CEO Steve Ballmer led an investment group that expressed a desire to buy the Sonics in 2008 to keep the team from leaving. The group failed to attract sufficient public funding to finance a new arena. Seattle, Wash. - A wealthy San Francisco hedge-fund manager is the lead investor seeking to build a sports arena south of Safeco Field to lure an NBA basketball team back to Seattle, according to two Seattle Times sources briefed on the effort. Christopher Hansen, 43, who has roots in Seattle and now heads Valiant Capital Management LLC, in San Francisco, is working with an investor group whose proposal has yet to be made public. Hansen, described to the Times by one source as a multimillionaire who previously lived in Seattle's Leschi neighborhood, public records show. Both men understand they need each other to make the proposal work, the source told the newspaper. Little has been written about Hansen or his company, according to a search of public records and the Internet. Valiant reported that its holdings of U.S. stocks were worth $779 million as of Sept. 30. Hedge funds can make a wide range of other investments whose value the funds aren't required to disclose. Mayor Mike McGinn's office confirmed Dec. 9 that it was examining an "opportunity" to bring an NBA franchise to Seattle, but declined to provide specific information. Ethan Raup, McGinn's director of policy and operations, declined to comment. Hansen apparently is focusing on land in the Sodo District, just south of Safeco Field's parking garage. For an arena to be built there, the city most likely would have to vacate a stretch of Occidental Avenue South, which bisects the potential site, the newspaper said. Among those involved in the Sodo plan is Wally Walker, the former Seattle Sonics player and team executive, sources said. Walker was a minority owner of the Sonics, serving as the team's president and general manager from 1994 until the team was sold to Clay Bennett in 2006. Seattle, Wash. - A wealthy San Francisco hedge-fund manager and officials in the Seattle mayor's office have been working behind the scenes for eight months to bring an NBA team back to the city as early as next fall and build a new arena, according to emails and documents that the Seattle Times says reveal a far more concerted effort than previously known. NBA commissioner David Stern also confirmed to the Salt Lake Tribune that he has met with the potential owner and has no objection to seeing an NBA team locate in Seattle as long as a suitable venue is available. In Seattle, a Dec. 13 agenda for a meeting between the parties shows they were talking about details such as a "Review of Basic Deal Structure," "Financing Issues," including "City Debt Capacity," and "Security for Public Financing." The documents, released to the Seattle Times under a public-disclosure request, also provide the first glimpse of how the largely unknown hedge-fund manager, 44-year-old Seattle native Christopher Hansen, approached the city about his desire to buy an NBA team and build an arena south of Safeco Field. "Thanks for spending the time today guys," Hansen wrote in a June 16 email to Julie McCoy, chief of staff to Seattle Mayor Mike McGinn, and Ethan Raup, the mayor's director of policy and operations. "I really appreciate it and look forward to making this happen in Seattle," wrote Hansen, a multimillionaire who built a fortune in the private investment world. "I genuinely mean that and am confident that with a little effort and creativity we can find a solution that meets our needs and the City's /State's desire to get a team back to Seattle without a large public outlay." Hansen offered to provide information on "recent municipal arena deals that have been put together and some of the direct and indirect contributions that the city can make that don't require incremental taxes or direct public funding." It was held at the law offices of Foster Pepper, one of Seattle's prominent law firms. An attorney with the firm, Hugh Spitzer, had been hired by the city in September to provide advice on selling construction bonds. Although the documents don't mention how Seattle would obtain a team, they show the city has been following developments in Sacramento, which is under a March 1 deadline to come up with a viable proposal to build an arena for the Sacramento Kings. In September, Hirsh emailed a copy of an Associated Press story to Raup that outlined the Sacramento situation. In addition, National Hockey League Commissioner Gary Bettman has expressed a strong interest in placing a team in Seattle, leading to widespread speculation that the financially struggling Phoenix Coyotes could be moved to Seattle. According to ESPN.com, Bettman said, "There are a lot of people who think Seattle would be a great place to have a team. The Pacific Northwest, the natural rivalry with Vancouver, another team in the Pacific time zone ... but there's no building." No final offer from Hansen's group has been presented to the city. Hansen heads Valiant Capital Management LLC, but his effort is said to be a personal endeavor. Seattle, Wash. - A New Jersey sports consultant advising Seattle officials about a potential deal for a new arena met privately with several City Council members, sharing financing ideas that include a wholly owned broadcast network, such as ones run by the New York Yankees in baseball and Texas Longhorns in college football. The education comes just before Chris Hansen outlines his plan for a new arena to Mayor Mike McGinn who will then provide details to the public. In an interview with the Seattle Times, Hansen, a 44-year-old hedge-fund manager and Seattle native, said, "We're very close to announcing our offer to the city. That's why I'm here." Hansen said he is only reluctantly stepping forward now because of the intense interest in and speculation around his arena proposal, the details of which are still not known. While he acknowledged that an arena can't be a burden on taxpayers, the package is expected to include a combination of private money and tax revenues spun from the facility. Hansen reportedly wants to bring an NBA team to Seattle, but the National Hockey League also has expressed a strong interest if an arena is built, prompting speculation about the financially troubled Phoenix Coyotes moving to Seattle. Hansen described his interest to the newspaper as building an arena and attracting an NBA franchise, saying others would have to come forward with a hockey proposal. He declined to say if hockey is crucial to a profitable arena, although others have said that it would be. In meetings, consultant Carl Hirsh, who was hired by McGinn in July, told council members the wealthy San Francisco hedge-fund manager who wants to build a new arena is seeking to identify possible revenue streams to finance the project, the Times reported. Revenue to build a Seattle arena and to cover the costs of acquiring NBA and NHL teams could come from admission taxes from events at the new facility, as well as the development of a lucrative television network, council members said. "They're proposing that revenue from their activities go to support their operations," said Councilmember Nick Licata, who in the past has been a leading critic of taxpayer funding for stadium construction. The tone behind the effort to build an arena has intensified in recent days, as new details emerged about serious talks between McGinn's aides and Hansen, and as Sacramento moves toward a March 1 NBA deadline to produce a viable plan for a new arena or risk losing the Kings franchise. McGinn, who has been working with Seattle native Hansen for eight months, has said no new taxes would be used to build an arena, and that the investors must make a substantial contribution. But Licata said he remained skeptical that no public funds would be involved. "There's no free lunch. I'm looking for the cost of the tab, but we won't see that for some time," Licata said after his briefing by Hirsh. Councilmember Jean Godden, who was briefed, said Hirsh "had a lot of facts and figures" but wasn't able to provide them to the council. Godden said the city might be asked to finance construction bonds for the project. Her concern, she said, is that any bonding not exceed the city's debt limit and not harm its AAA bond rating, which allows it to borrow money at lower interest rates. She said she's also concerned about the impact to traffic around the stadium district, particularly the effect a new stadium would have on Safeco Field, where the Mariners play, and on CenturyLink Field, the home of the Seahawks. "We have good partners in the two other stadiums. Suppose we have three events simultaneously?" Godden asked. Godden noted that the City Council will have to approve any deal that directs tax money to the arena or authorizes a construction bond. Seattle, Wash. - Seattle officials say plans to build a new arena in the city that could attract an NBA or NHL franchise is risk-free, according to the Seattle Times. Seattle Mayor Mike McGinn and King County Executive Dow Constantine said the arena could be built just south of Safeco Field with $290 million provided by private investors and $200 million in taxes generated by the arena, but that construction would not begin until the investors, led by San Francisco hedge-fund manager Chris Hansen, secure both NBA and NHL teams. "He's not going to put his money in until he's got a team, and we're not going to put our money in until he's put his money in," Constantine said at a news conference. However, other concerns about the plan are being raised. The Times said an email from the Mariners' transportation director to members of a Sodo business group expresses serious reservations about the potential impacts to traffic if professional basketball and hockey take up residence in an arena just south of Safeco Field, where the Mariners play, and CenturyLink Field, home of the Seahawks. "No - the transportation infrastructure is already over capacity; the two existing stadiums already struggle with scheduling overlaps. We want the NBA but in the right location. KeyArena sits vacant with bonds on it - that site should be redeveloped with event facilities spread through the city." The email was sent by Susan Ranf, Mariners transportation director, and includes the official Mariners logo next to her name. It was sent to more than a dozen people including Mike Peringer, president of the Sodo business association, who was taking an informal survey as a prelude to a more formal response to the arena proposal. Ranf said she thought the email was a private communication. She said it reflected only her opinion and not that of the Mariners. The team publicly supported the idea of a new arena. The Times said a new arena would be more of a concern for the Mariners than for the Seahawks and Sounders because the Mariners play far more home games, making it more difficult to avoid conflicts when the seasons overlap in the spring. McGinn and Constantine outlined an investment proposal that calls for no new taxes and, they said, shields the public from risk by requiring investors to make up any revenue shortfall. The deal also would put the teams on the hook for the public share if one of them left before 30 years. "We got a really good prenup," said Dwight Dively, King County budget director. Constantine said the 18,000-seat arena in the Sodo neighborhood would have the third-highest private investment in a professional sports arena anywhere in the country. "This proposal we've received is worthy of serious consideration," he said, alluding to the close scrutiny - already voiced by Seattle City Council members - that will now be given to one of the most ambitious projects launched in recent history in Seattle. Hansen, a 44-year-old Seattle native who lives in San Francisco, has agreed, along with partners he has not identified, to put forward at least $290 million to build the arena on land he has acquired south of the Safeco Field parking garage. He also would buy a professional basketball team, and recruit a hockey team. The NBA has said it will not expand, making relocation the only means to acquire a franchise. Sacramento, Calif., is facing the loss of the Kings if it doesn't produce a viable arena deal by March 1, and the fate of the financially troubled and league-owned New Orleans Hornets remains in question. Reports this week said the league is close to a deal with a new owner for the Hornets and a new arena lease agreement. The NHL's Phoenix Coyotes, which were taken over by the league, have been identified as the team most likely to relocate. 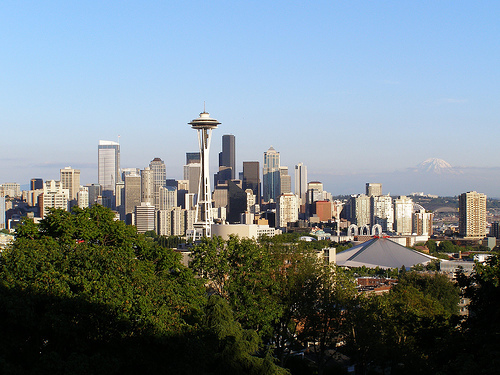 Both leagues have said they consider Seattle a desirable location. The public's investment would be capped at $200 million, likely in bonds, and would be repaid through rent paid by the teams and existing tax streams, including sales, property, admissions and business-and-occupation taxes generated by the arena. The city and county would own the arena and land and lease it back to the investors. Team owners would collect revenue from ticket sales, luxury suites and concessions, and possibly from a cable-television network that would broadcast games. City and county officials would work out how much of the $200 million in construction bonds would be financed by each, and both the city and county councils would have to approve the financing plan. A public vote would not be required. McGinn and Constantine insisted that the project would be "self-funding" because it would be paid for with city and county tax money that would not be generated if the arena were never built. McGinn and Constantine repeatedly stressed the ways the public was protected, including a security fund that could cover three years of debt payments. The investors also would have a fund for upgrades, so the city wouldn't be responsible for fixing up the arena as it ages. In addition, the private investors would take the risk and pay any shortfalls, while pumping money and construction jobs into a slow economy, they said. Seattle, Wash. - Promoters of a proposed new arena in Seattle say the Kings' deal with Sacramento won't stop their efforts, the Seattle Times reported. arena in Seattle," McCollum said in an email. "He has already purchased the land and put a serious offer in front of the City (of Seattle) and (King) County. It's up to the City and County now to evaluate that proposal and decide how they want to proceed." A spokesman for Seattle Mayor Mike McGinn said the city's focus remains on the arena proposal from Hansen, whose pledge of $290 million provides the foundation of a project estimated at $490 million. The public contribution from the city and county would be capped at $200 million and come from taxes generated directly from the arena and from rent paid by the teams. "Our focus is on the proposal we have before us and the public review, which is under way," said Aaron Pickus, a McGinn spokesman. "Any talk about a team is between Chris Hansen and the league." City Council President Sally Clark said she was happy for Sacramento, knowing how hard it was for Seattle to lose the Sonics. But she said her conversations with Hansen suggested that the Kings weren't the only team that might be lured to Seattle. "I take Chris Hansen at his word. He said the arena deal wasn't about Sacramento," she said. "Chris' proposal does not involve any public financing until a team is secured," said McCollum, Hansen's spokesman. "But getting an agreement with the City and County is a critical first step. Once that is in place, Chris will initiate a serious conversation with the NBA and show that he, along with the City of Seattle and King County are committed to building a world-class arena." An Arena Advisory Panel appointed by McGinn and King County Council Executive Dow Constantine will meet and review financing and other details of Hansen's proposal to ensure that it protects the city from financial risk and complies with Initiative 91, which says the city must make a profit from any public financing of a sports facility. The task force has been given a short timeline: just a few meetings by mid-March, when the City Council and Metropolitan King County Council may be asked to approve a framework for the deal. The timeline appears to be driven, in part, by a scheduled April meeting of NBA owners. Seattle, Wash. - Chris Hansen, the wealthy hedge-fund manager who wants to build a $490 million sports arena south of Safeco Field, met with a citizen review panel in Seattle, revealing that "healthy local ownership" would invest in facility construction and the acquisition of an NBA team. But the Seattle Times said the San Francisco-based Hansen declined to identify the other investors, telling the committee he would do that only when a franchise is acquired. "It's not my place to put other names out there," he said, although he did disclose that the investor group also would include people from his business network. Making his first public appearance since his public-private partnership plan was unveiled Feb. 16, Hansen spoke for about 45 minutes at City Hall. Hansen, a Roosevelt High School graduate with deep roots in Seattle, outlined his plan for private investors to pay $290 million for construction of a state-of-the-art sports and entertainment venue with approximately 18,000 seats. The public contribution would be capped at $200 million and would be repaid through city and King County taxes, as well as rent generated by the arena. Investors would guarantee a return on the city's financial contribution, create a reserve fund equal to three times the city's annual arena debt payments; enter a 30-year, non-relocation agreement for both teams; pay any construction-cost overruns; and pay the operating costs and upkeep of the arena. The review panel, which met for the first time last week, is to issue a report to the city and county officials. It was asked to ensure that the proposal protects the city from financial risk and complies with city Initiative 91, which required the city to make a profit from any public financing of a sports facility. The panel has been given a short timeline, by mid-March, when the City Council and Metropolitan King County Council may be asked to approve a framework for the deal. Speaking to reporters after his appearance, Hansen said he was willing to wait for opportunities to acquire teams. "I'm willing to be very patient, as measured in years," he said. Hansen has said he needs an official commitment from the city and county to negotiate with the NBA for a new professional basketball team. He has said another ownership group will secure an NHL team, but that both will finance and build the arena. Seattle, Wash. - A committee reviewing a proposal to build a $490 million arena want to know the financial depth of the investor group wanting to build the facility to validate its promises not to leave taxpayers exposed if the project fails, the Seattle Times reported. Chris Hansen, the San Francisco hedge-fund manager who has proposed making a $290 private investment in a new arena in Sodo, as well as purchasing an NBA team, has said he's willing to have an independent third party review his finances. But the other major investors, who have not been identified publicly, should also be vetted by the city and county, said Arena Advisory Panel members. Under the proposal, Seattle and King County would sell up to $200 million in construction bonds to finance the arena. Hansen's offer seeks to shield the taxpayers from risk by guaranteeing to cover the city's annual debt payments on construction bonds, in the event revenues generated by the arena fall short. It also promises to pay for operations and upkeep, as well as to create a reserve fund equal to three years of debt payments. "The beauty of this proposal is that if there's a gap in taxes, a gap in lease revenues, the investor has said: 'We're going to make you whole.' How do we make sure that pledge has teeth over 30 years?" asked Maud Daudon, the city's financial adviser to the arena-advisory panel. Panel member Greg Smith, a Seattle real-estate developer, said it's also important to see the investor groups' agreement with the NBA. Hansen's proposal has a 30-year non-relocation clause for both an NBA and an NHL team. In the event of a default or bankruptcy, the city and county could take over ownership of the teams. "The NBA franchise is truly an asset. The non-relocation agreement is the value," Smith said. The arena panel has a Friday deadline to conclude deliberations and deliver a recommendation to the city and county councils, but chairwoman Jan Drago said it would not be able to meet that deadline and would, instead, deliver the report in early April. Seattle, Wash. - In a strongly worded letter to city and county leaders, the Seattle Mariners say to find another spot for a new sports arena, according to the Seattle Times. "The proposed Sodo location, in our view, simply does not work," wrote team Chairman and Chief Executive Officer Howard Lincoln, in a letter to Seattle Mayor Mike McGinn, King County Executive Dow Constantine and members of the Seattle and King County councils. "It would bring scheduling, traffic and parking challenges that would likely require hundreds of millions of dollars to mitigate." The letter comes after the Port of Seattle wrote a similar letter to the city's Arena Advisory Panel studying the proposal. In that letter, Seaport Managing Director Linda Styrk warned of negative impacts on Port operations, potentially jeopardizing thousands of jobs and billions of dollars in maritime business revenue. "Based on the information provided so far, this project may put those jobs and economic benefits at serious risk without significant mitigation," she wrote. Lincoln says the Mariners in general support bringing in NBA and NHL teams, but he suggests that city and county officials look at alternate locations in Bellevue, Renton, Seattle Center and South Lake Union. He said a single investor should not be allowed to determine the site. Chris Hansen, a San Francisco hedge-fund manager, has proposed making a $290 million private investment in a $490 million new arena in Sodo, as well as purchasing an NBA team and securing an NHL team for the arena. Hansen declined to comment on the Mariners' letter, but has previously said he chose the Sodo location because it is zoned for stadiums, is served by light rail and buses and has freeway access. Mayor McGinn said the transportation issues raised by the Mariners will be addressed in the environmental-review process for the arena. The concerns the Mariners and the Port have about traffic congestion and gridlock are shared by maritime labor and manufacturing groups. At previous meetings of the Arena Advisory Panel, representatives from the longshoreman union and the Manufacturing and Industrial Council said the city and county have not delivered on transportation improvements promised with the construction of Safeco Field and CenturyLink Field, where the Seahawks and Sounders play. Dave Gering, executive director of the Manufacturing Industrial Council, said the city's original plans for the stadium district were to build three overpasses. One was built, he said, and some money for the second was diverted to complete the Mercer Street corridor improvements. He said the movement of freight from the Port through Sodo is crucial to the maritime industry's survival and the city's economic future. The arena proposal didn't address the freight-mobility issue or the public cost of meeting it, he said. "The problem isn't just �game days.' It's the congestion that already exists at 8 a.m. every weekday morning," Gering said. Seattle, Wash. - The San Francisco hedge-fund manager who wants to build an NBA arena is paying for a $50,000 traffic and parking study to help answer critics who say the arena threatens blue-collar jobs in Seattle's industrial area. The Seattle Times said the investor, Chris Hansen, appeared with Seattle Mayor Mike McGinn and King County Executive Dow Constantine in Hansen's first news conference since details of his proposal were released in February. Earlier, an Arena Advisory Panel approved the proposal, calling it "promising." Hansen, 44, said he already has several yet-unnamed local investors interested in joining him to bring an NBA franchise to Seattle and help build a $490 million, 18,000-seat arena for professional basketball and hockey games. Hansen wants taxpayers to pitch in $200 million in construction bonds, which he says would be repaid by revenue from the arena. If a large investment is needed beyond that to alleviate traffic congestion in the area - an overpass, for example - the deal would need more scrutiny. "We look at our deal holistically," Hansen said. "There's a certain amount of capital investment we're willing to put in this area." As details of his investment and proposal continued to trickle out, the first organized opposition to the arena surfaced. The Mariners expressed concern about scheduling and traffic, and the Port of Seattle and others in the local maritime industry said adding another sports venue to Seattle's industrial core threatens thousands of blue-collar jobs. Hansen also said the deal could go forward without hockey and that it was "highly likely" the arena could be built with only a basketball team signed and hopes for a hockey team later. Hansen would not disclose the names of investors he's working with. He said "a lot of people" are interested, and that he has "several local partners that would like to be a part of our basketball/ arena efforts," and three or four people thinking about buying a hockey team. He expects to announce his investment team sometime in June. Earlier a citizens panel charged with reviewing the proposal for a $490 million arena told Seattle and King County leaders to go forward with the plan, while also cautioning that many important questions about financing and traffic remain unanswered. "This is an unprecedented opportunity to bring two professional sports teams back to Seattle," said Greg Smith, a Seattle developer and member of the Arena Review Panel, commenting on plans to bring back professional basketball and to recruit an NHL team to Seattle. "We should ask how to make this happen, not say why it shouldn't happen," he said. The panel delivered its final report before a City Hall audience of about 50 that included a half-dozen fans in Sonics green and gold. The report noted that Hansen's proposal to contribute $290 million to a new sports and entertainment venue includes many guarantees to protect the public from financial risk. But the panel also concluded that a public investment of $200 million in construction bonds ultimately would be backed only by the resources and credit of taxpayers, in the event Hansen were to default or declare bankruptcy. "Make no mistake: There are a lot of hurdles to be overcome," said Jan Drago, former Seattle city councilwoman and co-chairwoman of the panel. Former Sonics coach Lenny Wilkens called Hansen's proposal an "unprecedented" public-private partnership and said the deal differs markedly from that between Seattle and the Sonics, who were sold and in 2008 moved to Oklahoma City. "It looks very promising, it looks good, but there are still things that have to be checked out," said Wilkens, who co-chaired the panel. The city's financial expert who advised the panel cautioned that the financial strength of the investment group and its business plan haven't been examined. "There's a lot to like in this proposal," said Maud Daudon, CEO of Seattle Northwest Securities. But she and the panel also recommended the city and county ask for an independent, third-party review of the investors' finances and business plan. Daudon said the city and county must write the financial guarantees into a contract that is legally binding for 30 years. The report now goes to Seattle Mayor Mike McGinn and King County Executive Dow Constantine. The two will draft a memorandum of understanding with Hansen that will be subject to review and approval by the city and county councils. Hansen has asked that the agreement be finalized by June so he can take it to the NBA Board of Governors and negotiate to purchase a team. His business plan also includes attracting an NHL franchise to the arena. Seattle, Wash. - The Port of Seattle, the Mariners and the Manufacturing Industrial Council that represents more than 60 businesses in the area all have objected to putting a new sports arena just south of Safeco Field, according to the Seattle Times. The groups say an estimated 200 events a year at the arena, including NBA and NHL games, would add to the congested traffic conditions in the north Sodo neighborhood and threaten the city's industrial engine and maritime trade. "Most of this would survive," says Dave Gering, head of the Manufacturing Industrial Council, as he surveys the giant cranes and colorful stacks of freight containers visible on the skyline just west of the Mariners and Seahawks stadiums. "But what part of $3 billion do you want to give up?" The Port of Seattle's marine-cargo operations on Elliott Bay are among the largest in the country and generate more than $3 billion in business revenue, state and local taxes, and about 56,000 related jobs. But, Port officials say, its success depends on the access and speed with which the trucks move the cargo from ships to the nearby rail yards and freeways. Chris Hansen, the San Francisco financier who has proposed a new 18,000-seat arena, stepped up quickly earlier this month and offered to pay for a $50,000 traffic study, hoping to allay some of the concerns about parking and congestion around the proposed arena. The study will review other cities with multiple sports venues to understand how they schedule events, will identify the alternate ways for fans to reach the arena and will evaluate parking in the Sodo neighborhood. It also will outline how the new teams could effectively manage traffic. Mayor Mike McGinn has hired former Deputy Mayor Tim Ceis to conduct outreach on the traffic study to stakeholders, including the Port and the Mariners. Ceis is being paid $43,000. The traffic study is due back to the City and County councils in six weeks. The short timeline worries the city's Freight Advisory Board members, who noted in a letter last week to McGinn and the City Council that the councils will be asked to approve a memorandum of understanding to proceed with the arena before the real transportation impact is understood. The board asked that the mayor and council not adopt the memorandum until the full effects of the arena on freight movement and international trade can be more thoroughly examined.